The kitchen team at Verdicchio Ristorante | Enoteca had the opportunity to spend time at Penokean Hills Farms this week. We are working with the Algoma farmers to incorporate their beef into our menu. They are also our partner in Beef Stack, our farm to table harvest dinner on Saturday August 25. 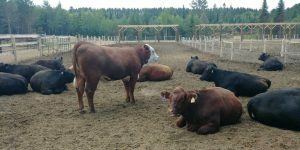 Penokean Hills Farms was created by a small group of five family farmers in 2005 with a goal to produce a premium-quality, 100% Northern Ontario brand of beef. Their mandate is to raise each animal in a high-quality, stress-free environment, but also to enhance the local environment and support the community. Chef Daniel Guerra along with prep cook Sophie Marion and line cook Brian Burton were impressed with Penokean’s philosophy and farming practices. Sophie shared some of her observations with us. Penokean Hills Farms differs from large scale farming, said Sophie, a difference that was immediately evident to her. Sophie said visiting the farm and getting the chance to chat with the farmers will impact that way she approaches her work in the kitchen.